80's Hard Rockin' California Beach Party with Van Halen Tribute "The Full Bug"
80's Hard Rockin' California Beach Party with Long Island’s own Van Halen Tribute "The Full Bug" - Featuring the best of Van Halen. David Lee Roth and Sammy Hagar eras and a special set of 80’s hair band favorites by Poison, Motley Crue, Ratt, Journey, Guns n’ Roses and more! It’s a flashback 80’s party like no other, you don’t want to miss! Eagles Tribute - Happy Hour, Dinner and Show with Long Island’s own Desperado Ridge. Enjoy spectacular waterfront dining and Fire Island sunset, while singing along to the greatest hits of the Eagles, performed by Long Island’s own “Desperado Ridge.” Reservations recommended. Yacht Rock Happy Hour, Dinner and Show with Long Island’s own, the Captain Cool Band. Enjoy spectacular waterfront dining and Fire Island sunset to the great smooth sounds of TOTO, FLEETWOOD MAC, STEELY DAN, AMBROSIA, CHICAGO, THE BEE GEES, HALL AND OATES, PLAYER, LITTLE RIVER BAND, CHRISTOPHER CROSS AND MORE! It’s going to be a night to remember. Don’t miss it! LDW 2018 SUNDAY FUNDAY REGGAE DANCE PARTY WITH KING WELLINGTON AND DJ EPIC! 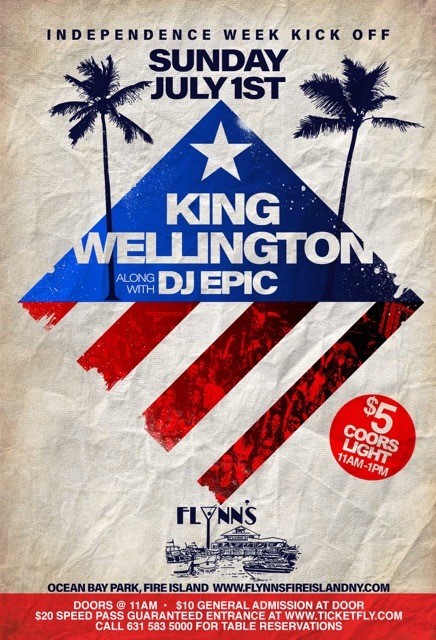 SUNDAY FUNDAY | REGGAE DANCE PARTY WITH KING WELLINGTON AND DJ EPIC | $5.00 CORONAS 11AM TO NOON. BADFISH - A TRIBUTE TO SUBLIME, SAMURAI PIZZA CATS AND Dj FOTS BEATS | $15 PRE-SALE | $20 DAY OF SHOW - CLICK HERE TO GET TICKETS NOW! SUNDAY FUNDAY | REGGAE DANCE PARTY WITH KING WELLINGTON AND DJ FOTSBEATS | $5.00 BUD LIGHTS 11AM TO 1PM. CORONA ELECTRIC BEACH WITH PAUL OAKENFOLD, GINO VARGAS, LIQUID TODD, MIKE BERARDI AND THEO! CLICK HERE TO GET TICKETS FOR ELECTRIC BEACH! FEATURED BREWERIES: FIRE ISLAND, GREAT SOUTH BAY, SAND CITY, BARRIER, BROOKLYN BREWERY, SIX POINT, MONTAUK BREWING COMPANY AND DUBCO BREWING COMPANY. ROCKET FEST - MUSIC BY CARLOS MELANGE, MFUSCO,JONATHAN MOVE, ELIA DROP AND SLICK. ROCKET FEST - MUSIC BY CARLOS MELANGE, MFUSCO,JONATHAN MOVE, ELIA DROP AND SLICK. | CLICK HERE TO GET TICKETS! 5TH ANNUAL PARROTHEAD FEST WITH JIMMY KENNY AND THE PIRATE BEACH BAND! Fins and Landsharks up! - Make your ferry plans for the 5th Annual Parrothead Fest at Flynn’s on Fire Island Saturday July 7th! Join Jimmy Kenny and the Pirate Beach Band for the traditional trek to Ocean Bay Park, New York! The all day affair starts at 12pm with the Ed Travers Band. Jimmy Kenny plugs in around 5pm. Win Jimmy Buffett tix! Landshark specials, raffles and giveaways all day! 4TH OF JULY DANCE PARTY WITH BOSCO AND BRANDO - RICKY JUNE AND GATOR. GINO VARGAS. STRIVE AND VADER. DOORS OPEN AT 11AM. $10 GENERAL ADMISSION AT THE DOOR. CLICK HERE TO GET ADVANCE TIX ONLINE NOW. CALL 631-583-5000 FOR TABLE RESERVATIONS. DOORS OPEN AT 11AM. $10 GENERAL ADMISSION AT THE DOOR. CLICK HERE TO GET ADVANCED $20 SPEED PASS FOR GUARANTEED ENTRANCE. CALL 631-583-5000 FOR TABLE RESERVATIONS. 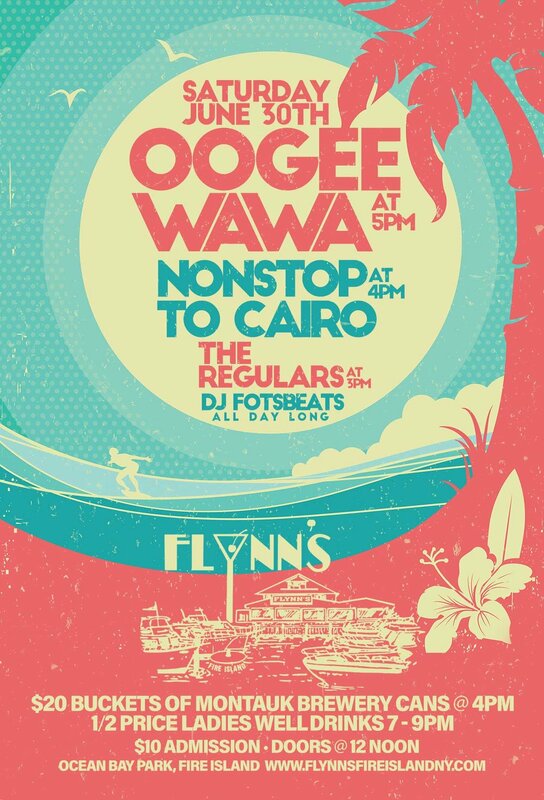 OOGEE WAWA at 5PM, NONSTOP TO CAIRO at 4PM, THE REGULARS at 3PM AND Dj FOTSBEATS ALL DAY! $20 BUCKETS OF MONTAUK BREWERY CANS STARTING AT 4PM | HALF PRICE LADIES WELL DRINKS 7PM TO 9PM | $10 ADMISSION | DOORS OPEN AT 12PM. THEO WITH MARK MK, CHRIS KENNY AND KING WELLINGTON! TEACHER AND MERMAID APPRECIATION DAY! 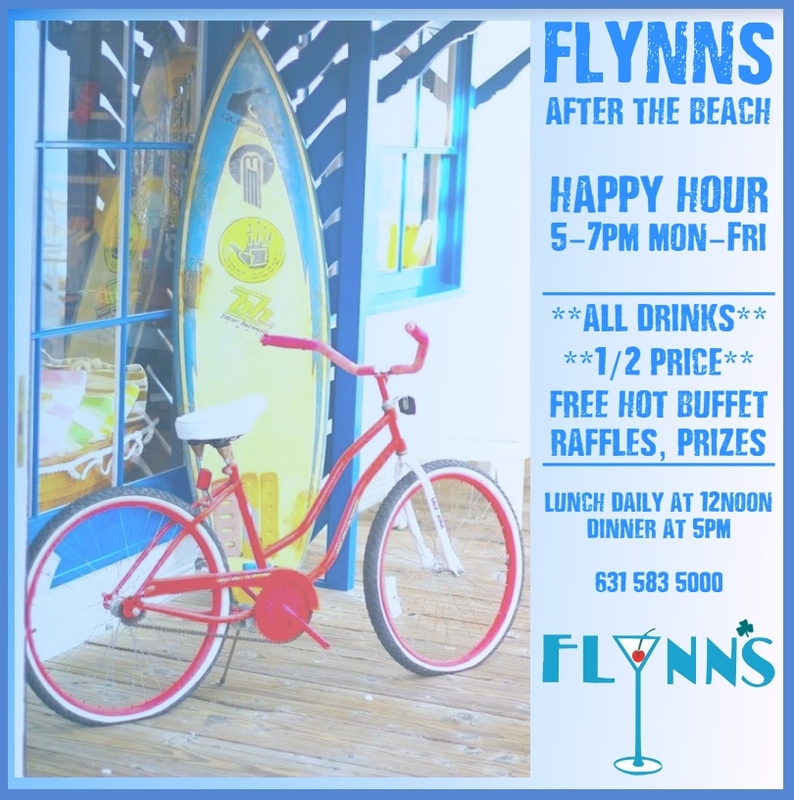 HOT DATE BAND AND Dj FOTSBEATS | $4 BUD LIGHTS 12PM TO 4PM | HALF PRICE LADIES WELL DRINKS 7PM TO 9PM | HOT DATE BAND LIVE AT 4PM | Dj FOTSBEATS ALL DAY LONG | CHANCE TO WIN A ROYAL GETAWAY! 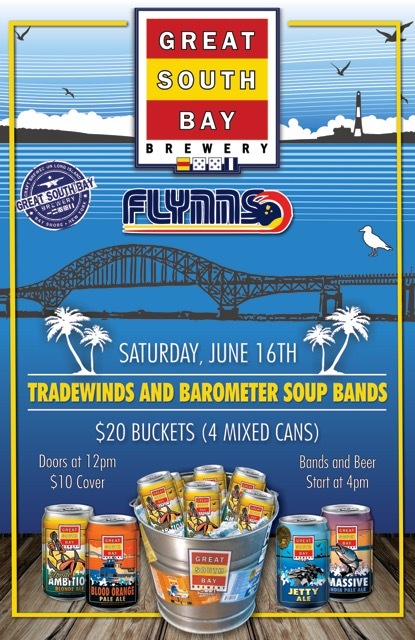 TRADEWINDS AND BAROMETER SOUP BANDS PRESENTED BY FLYNN'S AND GREAT SOUTH BAY BREWERY | $20 BUCKETS (4 MIXED CANS) | DOORS OPEN AT 12PM | BANDS AND BEER START AT 4PM.